If you do real work, you always will end up using spreadsheets and word-processing in some form or another. There are many options available now, but as I needed to preserve compatibility with my original Windows-XP based Excel spreadsheets, and my original MS-Word documents, I found I could use OpenOffice.org2.4 on my Fedora Linux boxes to work with my Windows-XP and MS-Word documents. I've avoided modern *feature* bloat on newer software, and just discovered that even OpenOffice (current, most-modern Apache version) is almost 2 gig of code - an amazing amount of bloat. I downloaded it, but as I only want basic Excel and MS-Word compatibility, it looked like too much noise. 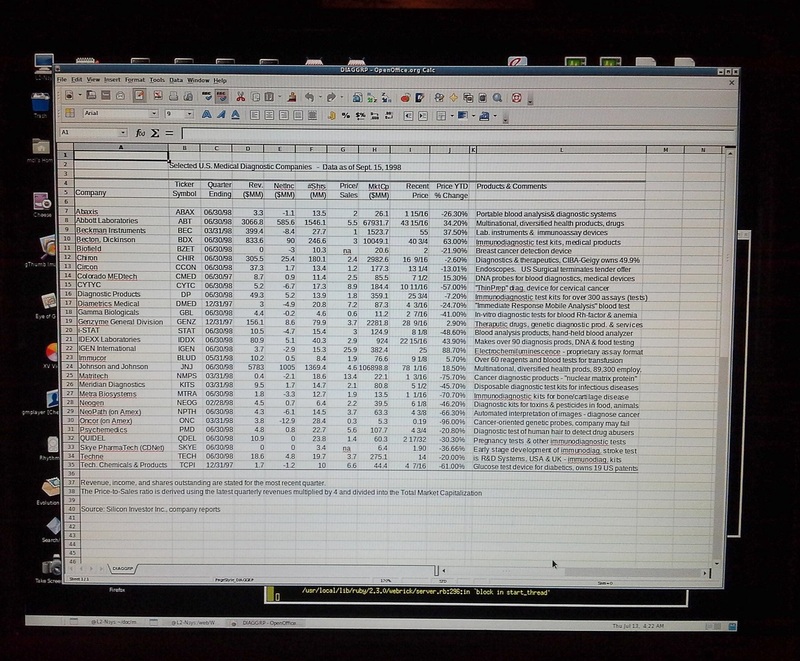 The screenshots show how Openoffice.org2.4.3 can function just fine, on CentOS 6.6, as an Excel and MS-Word replacement. I have been surprised by the compatibility - even a special spreadsheet, showing Japanese Hirogana and Katakana characters (the two phonetic Japanese syllabaries), and their romanji pronunciation, renders completely correctly in OpenOffice.org2.4. Problem was, there was not an easy and obvious way to get OpenOffice2.4 onto the CentOS box. So, I came up with a method, and thought I should document it here, for others who might need or want to do the same thing. I have noticed that all my original spreadsheets tested (and my current ones I use for financial analysis) all seem to work, as do all my MS-Word files. Note this caveat: I have always avoided version-specific features. I have no ".docx" files, for example. 1) Objective was to get OOorg Spreadsheet, Writer and Math onto the CentOS Linux 6.6 box. (It is 32-bit. You may well be able to follow similar steps for 64-bit modern versions of Apache OpenOffice. If you get it working, send me a note on the details.) From site: http://archive.apache.org/dist/incubator/ooo/stable/2.4.3 I downloaded the standard Linux-Intel file called: OOo_2.4.3_LinuxIntel_en-US.tar.gz (it is the sixth one on the list of archived versions on file). Just click on it to download, assuming you are running some sort of sane browser (I use Firefox 47 or whatever version it is now). Then, from your CentOS Gnome desktop, start an Xwindows bash shell and become root (su). 2) Create a directory called: /usr/local/src/openoffice.org and put your downloaded .tar.gz file there. This command will create a directory called: OOH680_m21_native_packed-2_en-US.9241 and that directory will have a subdir called RPMS. Navigate to the RPMS directory. (Note: Do you know that CentOS and Fedora have <Esc><Esc> option, to fill in the filename automagically? To cd to OOH680... dir, you can just enter "cd OOH<esc><esc>" and Linux will fill in the rest of the file name for you. This was a feature on TOPS-20, the best O/S ever made, in the early 1980s, running on DECSystem 20 series machines. Nice to see this feature in Linux. Really nice, actually). Note: I also installed the "openoffice.org-redhat-menus-2.4-9268.noarch.rpm" found in the "desktop-integration" subdir, but I doubt if it is needed. I couldn't find any Openoffice menus in my Gnome Applications, Places or System submenus. 5) If running in the Gnome desktop, logout and restart Gnome desktop. I typically start Gnome with standard Xwindows command: startx &. Not sure if this step is necessary. What I found was I could not start Openoffice.org2.4 after the install. Actually, I couldn't even *find* it. You should confirm the .rpm's were all installed correctly by running rpm with the -qa option (lists all packages), and grepping for openoffice (filters results to show only those with openoffice in name). rpm -qa | grep openoffice (this will list all openoffice.org packages installed. This will start up OpenOffice.org2.4.3, and you will have to A) accept the license (scroll down and press button) and then B) you are asked for user name stuff. I just leave all that blank, and then the default user name will just be "user". And then C), you are asked to register (which probably does not even work, since OpenOffice.org, which was part of SunMicrosystems, no longer exists. Openoffice.org (silly .org extension was because someone in Brazil or Europe owned the rights to "OpenOffice") was mainly a SUNW product, and when Oracle bought Sun, they eventually gave the whole thing to the Apache Foundation, which controls it now. See the Wikipedia pages for details, if interested). Anyway, just select "I do not want to register" option. This should then bring up a blank spreadsheet page, create all the .openoffice.org2 profile stuff, and you will know that the install was successful. 7) You can start the OpenOffice.org2.4 spreadsheet with "scalc" and the word-processor with "swriter", from /opt/openoffice.org2.4/program directory manually, at command line. But you can also just right-click anywhere on the Gnome desktop, and create your own launchers. <Right click on desktop, select "Create Launcher">. Just enter the command lines shown above into the "Command: " box, and you can start by clicking on the icon for the launcher you just made. Change the icon for each program by just clicking on the icon in the "properties" display. (Gnome is like Windows, in that you can right click on any desktop icon, and then select "Properties" to get program details. When the properties box displays, just click the icon, and you can change it to something more sane. In CentOS, check out /usr/share/pixmaps directory. There is also a Gnome icon directory which has icons for word-processing and spreadsheets. You can use /usr/share/icons/gnome/scalable/mimetypes/document.svg as the icon for the swriter app, and /usr/share/gnome/scalable/mimetypes/x-office-spreadsheet.svg for the scalc app. Example screenshots below show Openofffice.org2.4 running scalc to manipulate an Excel-created spreadsheet and swriter editing a test document originally created in MS-Word for Windows XP showing a (fake) example invoice. 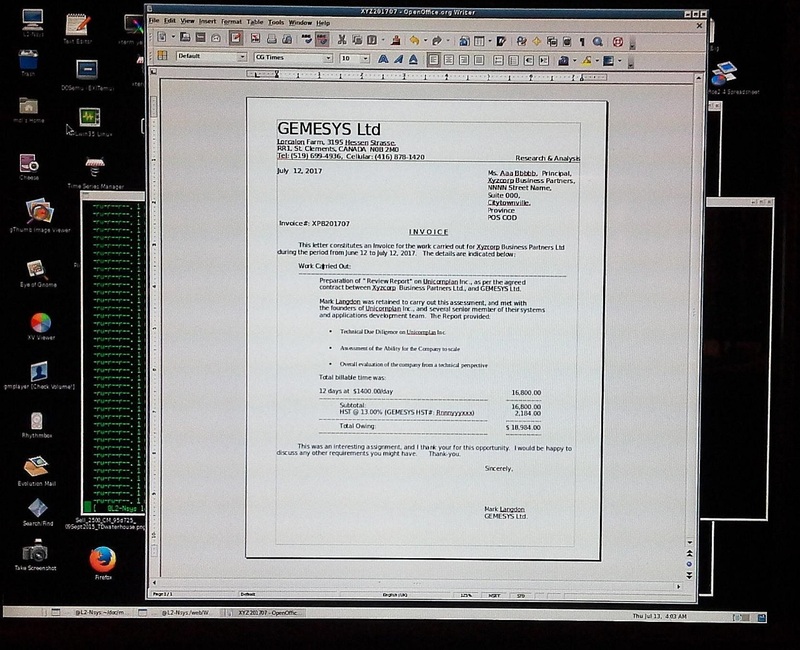 Example (fake) invoice, created using OpenOffice.org2.4, running on CentOS 6.6 Linux and Gnome 2.28.2. 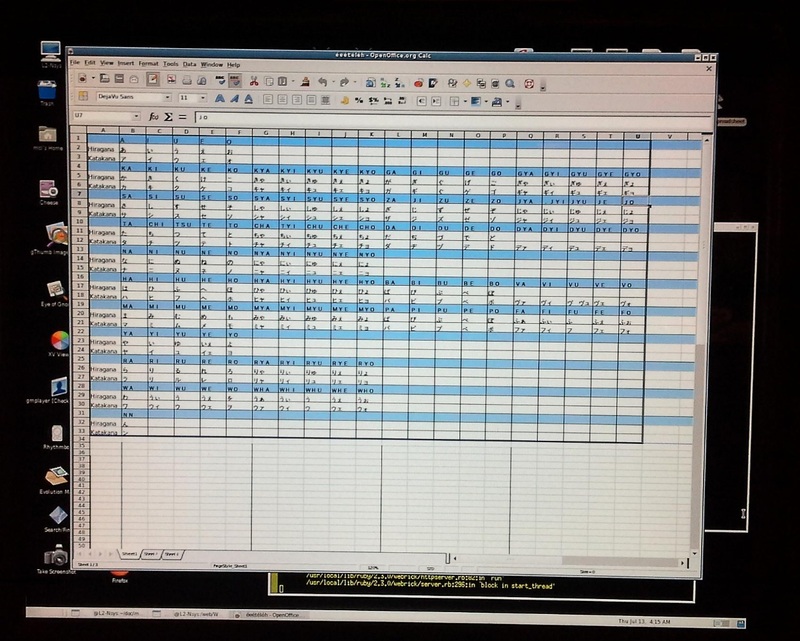 Example of Hybrid English/Japanese Spreadsheet, created in Excel, scp'ed from WinXP box to CentOS Linux platform, and rendered using OpenOffice.org2.4. Complete, 100% compatible, including the foreign font. No conversions or special processing was required.